In this paper, meta-residuals are discovered that can be used for tracing the impulse transmission in a dynamic factor model (DFM). They lead to considerable improvements of forecasts of some series and, more important, to a complete new formula for impulse responses. This formula uses future residuals, which were until now supposed to be zero. The endogenous dynamic and inner structure of a macroeconomic system is revealed. Furthermore, the impulse responses developed here solve the price puzzle - the counterintuitive increase in inflation after a hike in the federal funds rate. Below is a slideshow with the evolution of (the criteria for the) number of static factors in a DFM. The month in the title shows the last data point used for the corresponding computation. Preparing the presentation of meta-residuals for the R-meetup in Berlin in January 2018 showed me a missing detail that needs completion. The definition of the meta-residuals in the individual part is missing. They are obtained in the regular way while extracting factors. First, here is the code for the common component meta-residuals. I'll work on some cat & snake topics (read: neural networks with python) for some years and wish you lots of fun and success with meta-residuals! The pseudo out-of-sample comparison of meta-residuals for slow moving variables might be spectacular! The code for the regular DFM forecast is here: 23_forecast_DFM_S&W.R , consider that beta_Paul (see code and article appendix) might computationally simplify things a bit. Page 111 in the book “New Introduction to Multiple Time Series Analysis “(H.L., 2005; check online erratum of the book for this page) showed me how to program the inversion of the multivariate AR filter (I needed 2 weeks to program the whole function for asymptotic distributions of impulse responses for my master thesis; you don't need it in case you know how to inverse the filter, which I guess can be found also in other places like Hamilton). and see also this. 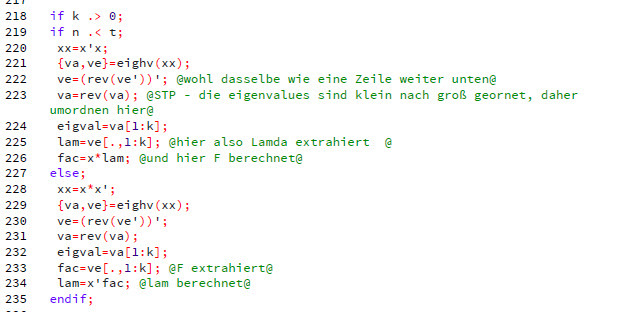 My comments (green, in German) state that Lamda is extracted and F computed vs. F extracted and lam computed. I struggled a lot (in vain) to fix the sign of the meta-residuals. You might think about flipping the sign of the loadings - they are now "obtained" (but hold constant) trough PCA. -1 * -1 = 1 remained the toughest thing to solve! The publication is registered with the United States Copyright Office, registration number TXu 2-067-929. There are some German similar counterparts. A last thing: I thought about how principal components can interact on different systemic levels (atoms, cells, organisms, psychology, society). Is it possible that factors on a higher level influence the lower level after their emergence? I guess it is an easy question but I don’t see the answer. A very last thing: the Buddhist meditation concept of one-pointedness of the mind (Ekaggata, https://en.wikipedia.org/wiki/Ekaggata ) might be interesting to be seen with Figure 2 of the article, and probably interesting for psychologists working with dynamic factors models.